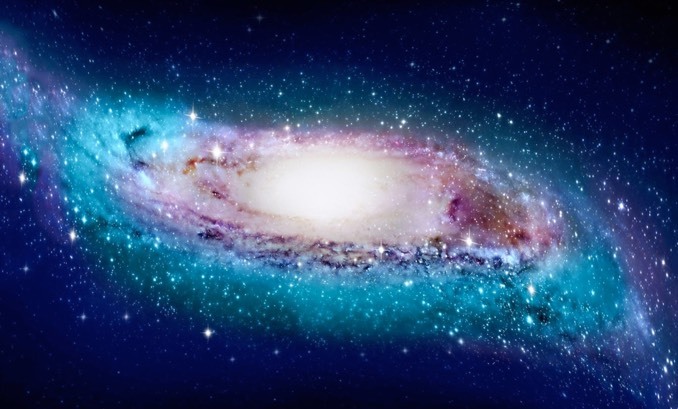 Using more than a thousand Cepheid variable stars as distance and position markers, an international team of astronomers have produced a 3D map of the Milky Way, showing it is not a flat spiral like the familiar Andromeda galaxy. 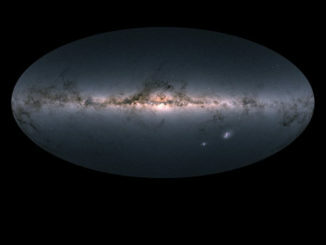 Instead, the team has concluded the Milky Way’s disc becomes increasingly warped and twisted the farther the stars are from the galaxy’s center. Cepheids are stars that pulsate in a regular cadence that is related to their absolute magnitude. 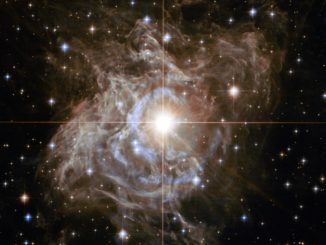 By comparing the apparent brightness of a Cepheid as seen from Earth with its presumed absolute magnitude, astronomers can calculate the distance to the star in question. Researchers with Macquarie University in Australia and the Chinese Academy of Sciences used a sampling of 1,339 “classical” Cepheid variable stars, all with distances known to within 3 to 5 percent, to map the Milky Way in three dimensions. They found the Cepheids generally reflect the distribution of gas in the galaxy’s disc. The 3D distribution of more than 1,000 Cepheid variable stars, centered on the Sun (shown as a large orange ball). The distribution reflects how the disc of the galaxy is warped near the edges. 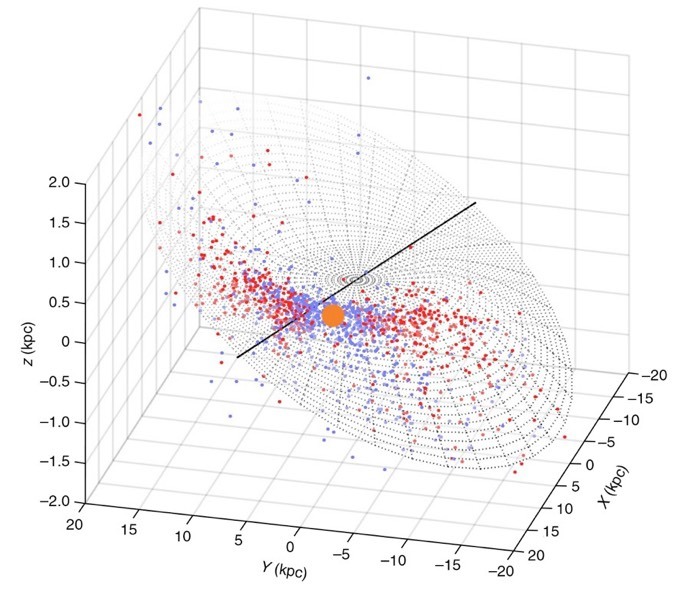 Image: Chen X, Wang S, Deng L, de Grijs R, Liu C & Tian H.
“Somewhat to our surprise, we found that in 3D, our collection of 1,339 Cepheid stars and the Milky Way’s gas disc follow each other closely,” said Richard de Grijs a professor at Macquarie University and senior co-author on a paper in Nature Astronomy. “This offers new insights into the formation of our home galaxy. “Perhaps more importantly, in the Milky Way’s outer regions, we found that the S-like stellar disc is warped in a progressively twisted spiral pattern,” he said. Over the past 50 years, astronomers have suspected hydrogen clouds in the Milky Way’s gas disc are somewhat warped and not orbiting the core in a flat plane. The new observations indicate the warping is real, likely caused by the spinning of the galaxy’s inner regions. “This new morphology provides a crucial updated map for studies of our galaxy’s stellar motions and the origins of the Milky Way’s disc,” said co-author Licai Deng, senior researcher at the Chinese Academy of Sciences. 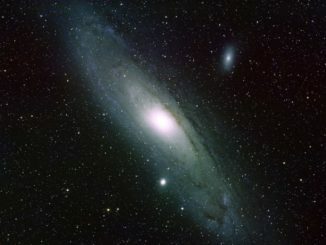 Studies of fast-moving stars in the Andromeda galaxy indicate the huge spiral is less massive than previously believed and more a twin of the Milky Way than a big brother.